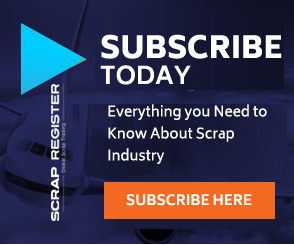 NEW YORK (Scrap Register): United Sates iron and steel scrap exports plunged by 36 percent to 1.122 million metric tons during the month of September this year and down 4.7 percent from a year ago, according to the latest figures from the US International Trade Commission. Turkey wast the biggest importer of US scrap during September with 268,925 metric tons, which represent a sharp decline of 42.7 percent from September last year and down 18.9 percent previous month. The other biggest importers of US iron and steel scrap are Mexico, with 188,699 metric tons; Taiwan, with 126,299 metric tons; Korea, with 121,102 metric tons; and China, with 109,344 metric tons. However, in terms of value, US iron and steel scrap exports totaled $299.4 million during the month of September, a drop of 14.4 percent as compared previous month and an increase of 8.5 percent compared to September last year.